Since releasing the first novels in "The Zombie Bible," I've heard from a lot of readers asking me what zombies have to do with the Bible -- or what the Bible has to do with zombies. The answer is a lot, and I'm not just talking about the Bible's numerous references to either the risen dead or the restless dead. After all, Western religion asks a series of nearly unanswerable questions: How do we, as a community, manage the excesses of human passion and drive? How do we maintain a just community while living in a world that wants to eat us? Is there a God in that world, and if there is, does he love us? And though they lurch out of left field and are rarely written by philosophers or theologians, zombie stories tend to stalk down these same questions and chew their way right into them. "When there is no more room in hell, the dead will walk the earth." That was the tagline for Romero's zombie flicks of the '60s and '70s. It speaks to a bleak vision of humanity -- that our species is capable of packing hell until it overflows with men and women who are so given to their hungers that eventually they exist only to feed those hungers, rather than their hungers existing to feed them. Zombie stories throw into sharp contrast the best and worst of what we are. In "28 Days Later," it is our capacity for rage and mindless violence that is highlighted; in "Dawn of the Dead" and "Shaun of the Dead," it's our rampant consumerism; in the original script for "I Am Legend," it's our ability to hate. Zombie stories boil all our postmodern angst down to one of the essential religious questions: How bad are we? And does love trump that? In religious terms, are we creatures of sin or creatures of love? Fyodor Dostoevsky said that hell is the inability to love. Zombie stories go a step further, defining hell-on-earth as what happens when not only are we unable to love but the only way we know to seek union with another is to devour them. The Bible warns about wolves in sheep's clothing, and Jesus instructs Peter three times to show his love by "feeding the sheep." But what if we live in a world where the sheep eat the sheep? What then? Besides gore, a trademark of the zombie story is those gray, vacant eyes. The dead look at you and they don't really see you. They see food. That's all they see. I don't know if there are many things more horrifying than to be seen by another human being as nothing more than an object to consume. The philosopher Levinas describes the way that the human gaze demands a response. To look into the eyes of the other is to see their demand that you recognize them as not other, as someone who is like you, someone who hungers and suffers and loves even as you do. The dead don't do that. Can the living? The first article of Judeo-Christian theology, one of the earliest statements made in the Old Testament or the Torah, is that humanity, male or female, is created in the image of God. Zombie stories force us into a place where we have to interrogate that, or at least question how faithful we have been to that ethical statement. Do we see something divine and valued when we look at another man or woman, or do we see food for our fears, our ambitions or our needs? AMC's "The Walking Dead" repeatedly presents its ragged crew of post-apocalypse survivors with ethical dilemmas, demanding that they choose between what may be necessary and what may be right. As though to force the question: How do we live together in a rapidly decomposing world? Zombie stories wrestle with free will. Do the survivors have the ability to determine their future, or are they doomed from the beginning by the hunger of their race and the moral and physical evils of a dead world that live on unburied? Novels like "I, Zombie" by Hugh Howey cast the life of the zombie in the same light. 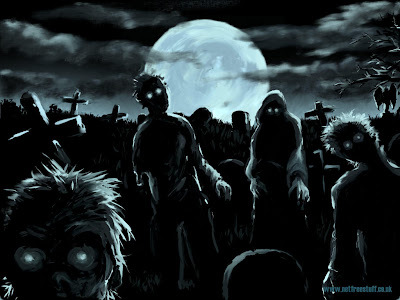 Howey's zombies are still conscious and retain the memories of their past lives, but are powerless to halt their violent actions -- because their hungers are a continuation of the hungers and addictions under which they lived. If, either on religious or philosophical grounds, a zombie story suggests that we do have choices, then the zombie story becomes an allegory of hope. Father Polycarp in "What Our Eyes Have Witnessed" emphasizes the need to live lives of unstoppable hope, even in the face of almost certain failure. He says this in a Roman ghetto in the second century A.D., as the dead devour starving survivors who have been abandoned by their uphill neighbors. Possibly zombie stories are so attractive to us because they ask this final religious question: What reason do we have for the hope within us? Why, in the face of the global food crisis, a genocide every decade, climate change, world poverty and finally, the ravenous dead -- why, in the face of all that, do we not just lie down and die? Zombie stories invite us to write for ourselves a secular theology of the dead. And to our battered world here in the early 21st century, that elusive theology remains a uniquely appealing one.